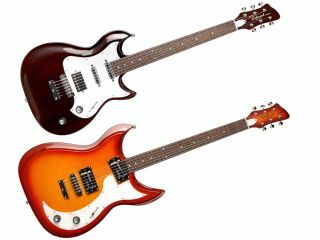 Godin Guitars has announced two new electric guitar models: the Richmond Belmont and the Richmond Dorchester. These are the first two models released under the Richmond line - named after the town they were crafted in: Richmond, Quebec, Canada. The Belmont features a 24-3/4" scale, solid mahogany neck and body with two single coil Lipstick pickups and a Seymour Duncan '59 humbucker in the bridge. There´s also a 5-way switch with separate volume and tone controls and a choice of two colours: Black Wash HG or Burgundy HG. The 25-1/2" scale Dorchester features two Lace Alumitone humbuckers, a silver leaf maple body with poplar wings and a rock maple neck. Controls include separate volume and tone knobs and a 4-way switch. This model is available in Black HG or Cherry Burst finish. Both guitars come with a chrome roller bridge with a fixed tailpiece, chrome Kluson tuning machines and Nordic white pickguard and truss rod cover. The Belmont has an RRP of $1195, while the Dorchester will set you back $1250.